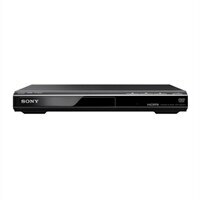 Sony DVP-SR510H Black DVD PlayerExperience a quality picture and solid sound in a compact design with DVP-SR510H DVD Player from Sony®. This versatile DVD player features fast/slow playback so you don’t miss a word. Also, it features Multi-brand TV remote control which allows you to operate major brands of television and this DVD player. You can also view movies and photos and listen to music using this DVD player with multiple format playback. It supports DVD/DVD-RW/DVD-R/DVD+RW/DVD+R DL and CD-R/CD-RW discs plays WMA, AAC, LPCM, MPEG1 (Cyber-shot® movie), and JPEG files. The Sony® Precision Cinema Progressive technology also employs separate algorithms to process the moving and still parts of an image, resulting in sharp backgrounds with moving objects that are virtually free from artifacts. Additionally bring your photos to life and enjoy highly detailed, Full HD 1920 x 1080p images with the Photo TV HD mode. Moreover, multiple-disc resume allows you to power on your player and return to the last scene you were watching on up to six of your most previously watched discs without having to search. With all this amazing features, this DVP-SR510H DVD player is an ideal complement to your audio/video entertainment system. Experience a quality picture and solid sound in a compact design with DVP-SR510H DVD Player from Sony®. This versatile DVD player features fast/slow playback so you don’t miss a word. Also, it features Multi-brand TV remote control which allows you to operate major brands of television and this DVD player. You can also view movies and photos and listen to music using this DVD player with multiple format playback. It supports DVD/DVD-RW/DVD-R/DVD+RW/DVD+R DL and CD-R/CD-RW discs plays WMA, AAC, LPCM, MPEG1 (Cyber-shot® movie), and JPEG files. The Sony® Precision Cinema Progressive technology also employs separate algorithms to process the moving and still parts of an image, resulting in sharp backgrounds with moving objects that are virtually free from artifacts. Additionally bring your photos to life and enjoy highly detailed, Full HD 1920 x 1080p images with the Photo TV HD mode. Moreover, multiple-disc resume allows you to power on your player and return to the last scene you were watching on up to six of your most previously watched discs without having to search. With all this amazing features, this DVP-SR510H DVD player is an ideal complement to your audio/video entertainment system.